We offer a range of Tarlock cigarette filters to fit standard filter tipped cigarettes, roll ups, slim line and super slim, alongside other smoking accessories. Although cigarette tar filters have been available in the UK for many years, at outlets such as Lloyds Chemist and Asda, due to restrictions on advertising, most UK smokers remain unaware of the products existence and health benefits. Tarlock cigarette filters help you to protect your health by catching and holding a substantial amount of the tar and other harmful substances found in your cigarette. This can be clearly seen from the very first cigarette you smoke. Tarlock cigarette filters are made from food quality plastic, which carries no taste. Each cigarette filter is reusable. ...drastically reduce intake of tar and other toxins without losing the taste. Avoid litter fines in outdoor smoking areas. Take your stubs and ash home. These taste of nicotine for up to 4 weeks but contain no nicotine and no tar. "I started using Tarlock’s cigarette tar filters 6 months ago, and after seeing the dark brown gunk they collect, I wouldn’t fancy smoking without one". "Tarlock cigarette filters really work!!! My dentist thought I’d quit smoking." "I used cigarette tar filters for years when living abroad, but struggled to find them after my return to the UK. Then I found Tarlock’s cigarette filters and wouldn’t use anything else." Using Tarlock cigarette filters will help to protect you against this newly discovered health risk by catching and holding air born fibres within the filter, helping to prevent them from entering your lungs. Tarlock do not contain any chemicals, charcoal or other loose fibre, they simply use centrifugal force to place a barrier between you and the hazardous toxins found in your filter tipped cigarettes. Our cigarette filters DO NOT contain any chemicals, they simply use centrifugal force. As the smoke is drawn into the cigarette filter it passes through small holes which causes the smoke to spin at speed in a whirlwind effect, this forces the heavier particles (mainly tar but also other hazardous substances) to the outer edge, where it sticks to the inside of the cigarette filter wall. This toxic sludge is clearly visible from the very first cigarette smoked, regardless of the strength. Each cigarette filter can be used again and again. Once the yellow area is full, simply discard and replace with a new one. We have so much faith in the exceptional health benefits and performance of Tarlock cigarette filters, that we are pleased to offer our customers a 30-Day Money Back Guarantee if our product does not perform as promised. We use Paypal as our payment processor but you don't have to have a Paypal account to use it. You can pay directly with your credit or debit card. Click the Add to Cart button and when you see the Paypal shopping cart page you can select the yellow 'Paypal Check out' button to pay using your Paypal account, or the grey 'Check out' button to pay with your credit or debit card. Your payment still goes thru Paypal to our Paypal account but you don't need a Paypal account. NB. 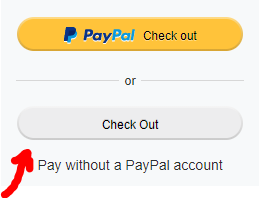 At the end of the checkout process Paypal will ask if you want to open an account - make sure you answer 'No thanks' or your order will not complete.